Helen Josephine Maund was born in Paddington on January 20, 1916, the third youngest of ten children, two of whom died in infancy. Her parents were Roeallan George and Mary Agnes (nee D’Arcy). Helen was an infant when the family moved to Lismore because of her father’s employment as a railway guard. Subsequently, the Maunds moved to Kempsey and finally back to Sydney. Over these years Helen attended Catholic schools run by the Presentation, Mercy, Dominican and Josephite Sisters. After graduating from business college, Helen secured a position with the Catholic Broadcasting Company, advancing to become secretary to the studio manager. In 1943 Helen responded to the call to religious life. Her younger sister Ruth was already a member of the Sisters of the Good Samaritan, and Helen approached Sister Mary Clare Slattery to discuss her wish to join this congregation. On January 6, 1944, at almost 28 years of age, Helen entered the Good Samaritan Novitiate at Pennant Hills and was given the name of Sister Mary Augustine, but reverted to her baptismal name many years later. Her profession of vows took place on January 6, 1947, after which Helen moved to Glebe where she attended St Scholastica’s Teachers’ College. 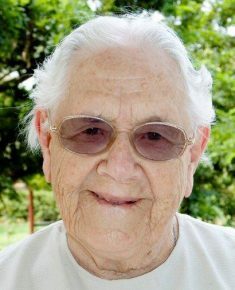 After obtaining her Certificate of Teaching in 1947, Helen began her ministry of teaching which would continue for some 22 years and take her to schools in New South Wales, the Australian Capital Territory and Queensland. Helen was small in stature but big in care of her students to whom she always spoke very kindly. While ill health led her to retire from the classroom in 1970, Helen continued her association with schools, using her skills as secretary and librarian for a further six years at Mount St Benedict College, Pennant Hills. From 1979 until 1991 Helen contributed to community life in Windsor, Moruya and Mitchelton. While at Mitchelton, Helen and her sister Ruth joined a conference of the St Vincent de Paul Society and packed medical supplies for Catholic missions and first aid posts in New Guinea and the South Pacific. Their ministry together continued in the care of the Good Samaritan Sisters at Nyanza and then The Pines, Carseldine, followed by community outreach from Camp Hill Convent, until their move to Five Dock in 1998. In 2002, Helen and Ruth became members of the Dalton Gardens Retirement Community at Ryde and finally moved to Bethany Hostel Eastwood in 2005. They had 10 years there together until Ruth’s death in 2015. The Maund family had been close and although Helen felt Ruth’s death keenly, she said that she was grateful that Ruth had died first. Helen was greatly comforted by the attentive kindness of her two nieces. Helen was always concerned for others and her keen mind kept abreast of all that was happening in the world around her. Helen’s death came quickly and quietly; she died peacefully at Concord Hospital on January 17, 2019, just three days short of her 103rd birthday and in the 76th year of her religious life.